Blue Footprints Eco Lodge wins hands down when it comes to environmental ethics and endeavour. There are very few places where you can disown the guilt about your carbon footprint and relax in style, knowing you have chosen well. For this unique beach hotel uses solar energy for lighting and hot water and there is no air-conditioning as the sea breezes do the job just as well. Everyone remembers and raves about the food at Blue Footprints – it is so delicious and so wholesome and now you will understand why: all fresh produce comes from local growers which supports local entrepreneurs and decreases the need to drive anywhere looking for food and wasting energy. Fresh fish direct from the ocean at Tofo and Barra ensure succulent seafood meals marinated in originality. And you know that no endangered or vulnerable species are caught for food at Blue Footprints because they care about the conservation of the ocean. This is revealed in the quality of the scuba diving here in Inhambane – view the rich marine wildlife in all its glory when you dive down into unique dive sites. Manta rays and sharks cruise these waters and are the subjects of varying research projects in the area. The lodge borrows the expertise of other dive centres nearby to treat their guests to dives of a lifetime. So tuck into meals that start with genuine grilled prawns marinated in lime and chilli and end with scrumptious homemade chocolate mousse. The talented chef carefully chooses his ingredients and designs his menu to surprise every guest and to show them the exotic flavours of this region. Dine slowly, remembering the subtle flavours and the care that went into the creation of such glorious cuisine. Yes, it brings people back for more, again and again. They come to indulge in their favourite Mozambique flavours and to sip cold local beers while planning another dive tomorrow. Look out for majestic Humpback whales in the area from June to October. Choose Blue Footprints for its beautiful outlook, its great value for money, its fine food, its green conscience and its unique location that is more private and exclusive than other venues in the Inhambane-Tofo area. Surfers flock to Tofo Barra beaches to catch waves and chat to new friends in local pubs up and down the coast. Blue Footprints sits on its own private bit of beach, allowing for more space and tranquillity than many other beaches in this part of Mozambique. Make the most of the bar, restaurant, lounge and swimming pool as you relax in sun and surf. Sit on expansive decks as you tantalise your taste buds. Stay in only 5 luxury villas designed for maximum privacy and access to the quiet beach. Breath-taking views make your day and the clever blend of rustic chic décor ensures you have a relaxed hotel in style. 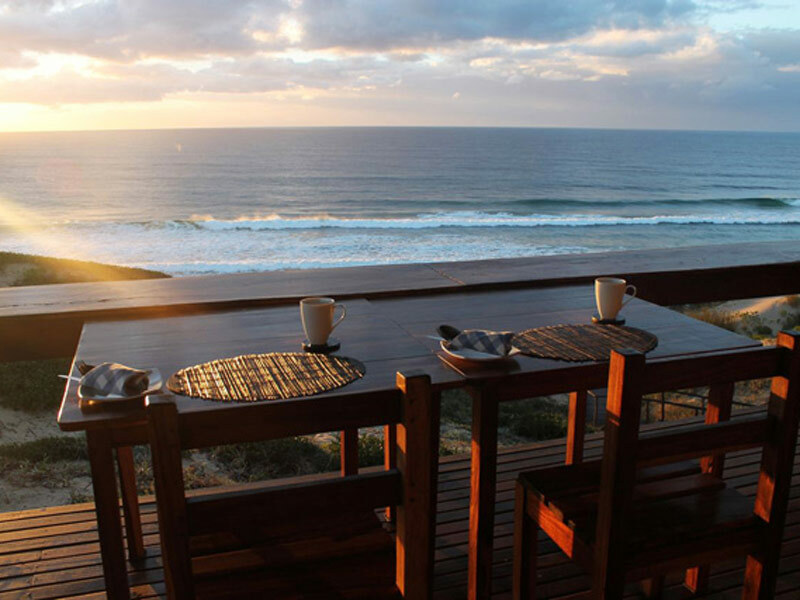 Pay only R1150 per person per night in a villa out of season, including breakfast, dinner, teas and coffees. Book your culinary diving experience with our consultants now.